Did You Ever Wonder Where The Sleeping Bag Idea Started? 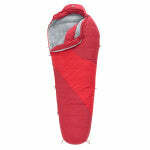 Home > Blog > Did You Ever Wonder Where The Sleeping Bag Idea Started? Sleeping outside is always an amazing experience at summer camp. Of course, you won’t enjoy a night under the stars very much if there isn’t anything underneath you. You need the right camping gear with you! Sleeping bags are a fairly important item to a camper who finds him or herself roughin’ it! But people certainly had to sleep on the ground before sleeping bags were invented, right? Well, sure. It’s just nobody said that they had to be comfortable when they did it. That’s not to say that they didn’t find ways to provide warmth and even comfort—quite the contrary! What people used to do is roll up wool blankets with themselves inside. I’m sure it was extremely comfortable, it just wasn’t very convenient. Not as much as a sleeping bag. There was no zipper to allow an easy in and out. There wasn’t any insulation fill. And there certainly weren’t any temperature ratings! A more modern concept for the sleeping bag didn’t come around until the 1850’s when patrolling officers of France would keep watch in the mountains. They carried large bags with them that had been made of sheepskin lined with wool. They would roll the wool up inside the bags and keep the wool buckled in place. Then, a decade later, another man, an explorer named Francis Fox Tuckett designed a “sleeping bag” out of a blanket that had a waterproof, rubber bottom. Not much more than oversized bags of warm material, neither of these bags offered the convenience of modern day sleeping bags. Sleeping bags would have to wait until 1913 for the zipper to be invented, but before that, in 1876, a man named Pryce-Jones introduced what is considered the first sleeping bag, called the Euklisia Rug. It still didn’t really look like a sleeping bag. And it didn’t roll up. It was really just a folded up blanket. It had a pocket at the top for an inflatable rubber pillow that was sewn in. When you laid down on the Euklisia Rug, you would fold the rest of the blanket over, wrapping yourself and fasten it shut with clasps.